Broadway station is one of the more popular Canada Line stations but it's surprising to know that not that many people know about Marulilu Cafe which nearly faces the station. 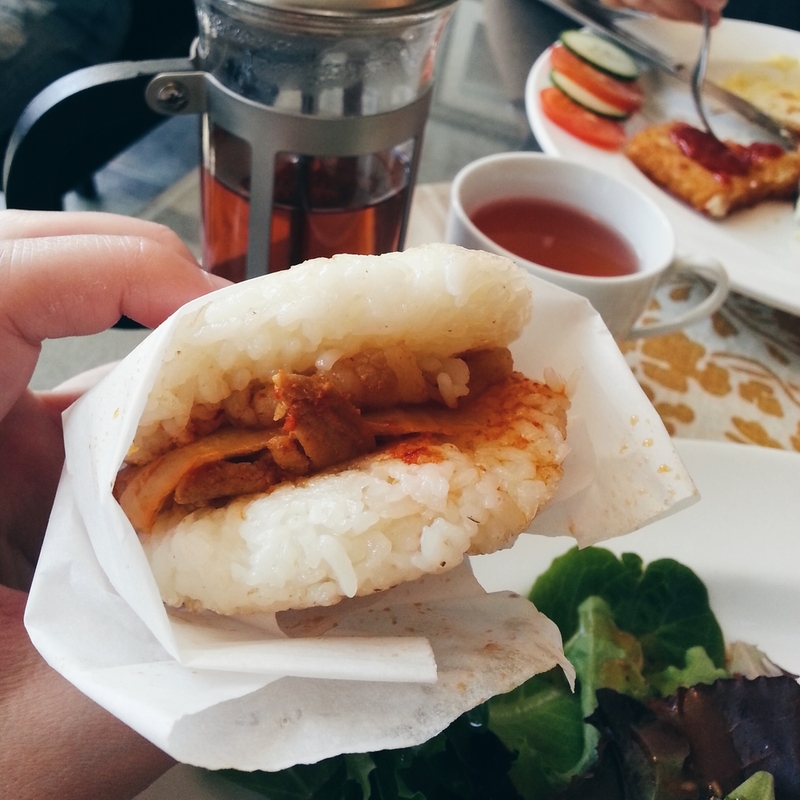 Marulilu is a small Japanese brunch and tea time oriented cafe which only caters to roughly 10 people per sitting. Despite this, it makes the dining experience very cozy - something my friend and I were looking forward to. 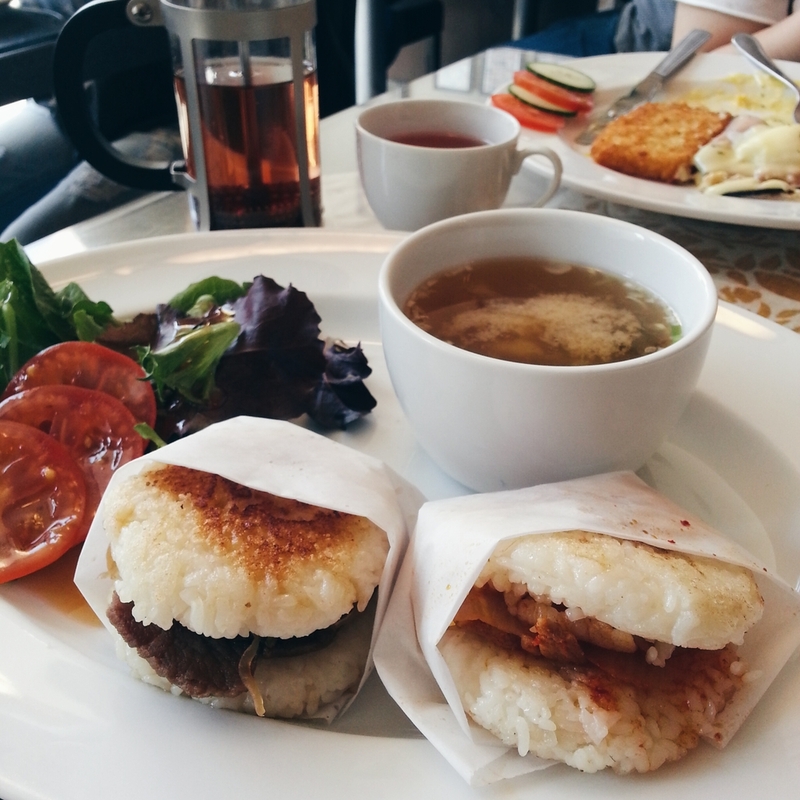 We weren't too hungry so we only ordered a plate each - one Eggs Benny and a set of Rice Burgers. My friend's egg benedict ($6.99) came with two halves of an English muffin topped with ham, a runny egg and a lovely hollandaise sauce with a side of hashbrowns and vegetables. It was a small portion but with a satisfying level of flavour and savoury-ness. I ordered something a bit different, the rice burger set ($9.99) which came with two different flavours and miso soup with a bit of salad on the side. Excited to try this interesting and cute combo, I might have had had too high expectations for this dish. For the sukiyaki burger, the meat was nice and juicy but other than that, really lacked in falvour. I expected the rice to add to the flavour or texture but I didn't really find that it did. Same goes for the butakimuchi burger. The portion sizes were also tiny, a rice burger was nearly the size of my palm. I also got a pot of lavender tea ($2.25) which wasn't too bad. I might have been slightly disappointed by the rice burgers but from their menu, I see a potential in a revisit for dons, desserts, or afternoon tea.